The ways in which we remember and memorialize historical events have been changing, from heroic triumphalism to a more nuanced and sensitive commemoration of those who served. In this well illustrated book, Nahas, a retired Army colonel who served several tours in Vietnam, gives us a look at over a hundred Vietnam war memorials across the nation. These memorials, he reminds us, are not only for those who died in the war, but also those whom they left behind, families, comrades, and friends. Each state is represented by at least one memorial, and in some cases by as many as five, since many localities have chosen to put up their own memorials. For each memorial,Nahas gives some background on its origins and design, a discussion of the symbology and, of course, a number of illustrations, in color. Several maps show us the locations of the memorials across the various regions of the country. Nahas also occasionally includes poems, plans, and other materials related to various memorials. Two sections of the book are are devoted to some special topics, such as the Moving Wall and memorials to Gold Star families and women who served. Nahas has, unfortunately, not included memorials in the U.S. territories, which also suffered losses in Vietnam; the memorials in San Juan, Puerto Rico, and Umatac, Guam, have more names on them than do those in several of the states. 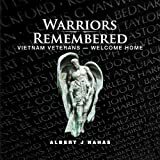 Warriors Remembered will prove a useful work for those interested in the memory of Vietnam and in the evolving ways in which we commemorate wars.